Today is my birthday and to celebrate, I wanted to give a gift to all of my wonderful blog readers. September is National Hat Month and since I am such a big fan of vintage hats, here's a lovely free sewing pattern for all of you. I bought this pattern at an antique mall in 2012 but it sat in my stack of unfinished projects until now. 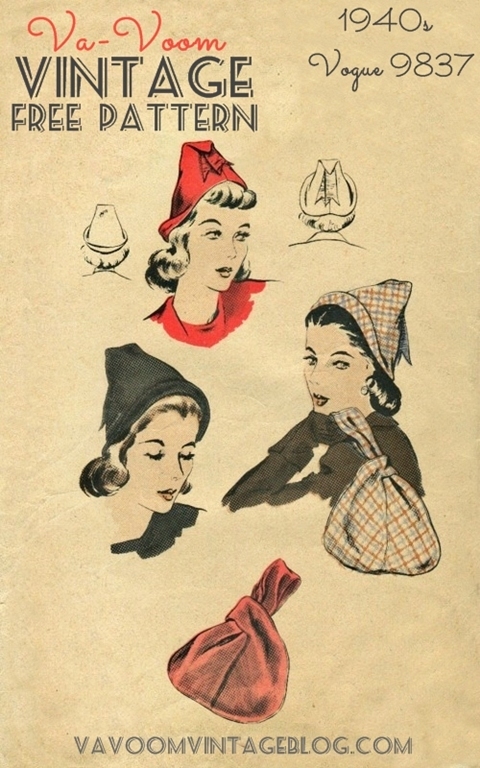 This pattern is for a gorgeous 1940s hat and bag from Vogue's # 9837. It would be beautiful in wool for autumn and winter but bring it back in the spring and summer in linen with hand embroidery on the brim. The handbag pattern pieces had been lost over the decades so I drafted the new pattern pieces according to the instructions. The pattern instructions mentions "crinoline" which is not the same as netting for crinoline skirts. You can find crinoline at most major fabric stores with buckram and other millinery fabrics. I have ordered some online in the past from Judith M and have been very happy with their products. Please note, this pattern was posted free of charge so that everyone may enjoy it for free. I spent many hours working on this pattern and converting it into a printable PDF, digitally restoring the instructions, images and drafting the missing handbag patterns from scratch. Please respect that and follow my use policy. I love to support fellow crafters so if you do make items to sell with my patterns, please drop me a message with your shop link so I can give you a shout-out! Happy Birthday, Brittany! May your day be filled with blessings! Happy Birthday! Thanks for the download! Happy Birthday, you beautiful lady. Happiest birthday wishes, darling Brittany!!! I hope dearly that that you have an amazing, super fun, vintage filled year ahead and that everything you wish for today comes true. A very happy birthday to you, I hope you have a delightful day filled with fun!!! Thank you for sharing such a lovely pattern with us! Happy Birthday Brittany!! thanks for sharing the pattern! Aw. It's your birthday and you're giving presents! Thanks!